Have you ever lingered in the bathroom at a social event to take a few extra minutes to re-gather yourself? Have you ever found that working alone was much more productive? Or, on the flip side, that working alone was much less productive? I can definitely answer “Yes” to all three. If you’re looking to understand why you answered these questions the way you did, then “Quiet – The Power of Introverts in a World That Can’t Stop Talking” might help. Like other writers I love, Susan urges us to question the status quo of how we interact. Why are some people energised by parties while others prefer smaller groups? What is the myth of the charismatic leader? Why do we insist on brainstorming in groups when some of the greatest creativity happens alone? In a business context she urges us not to accept that any single path will be the silver bullet to the best ideas and best results. Be yourself.While we each have a baseline personality type, we all have some introvert and some extrovert in us. Both need to be nurtured. Having read the book, I’m now including more quiet/alone time in my schedule to restore my energy levels. Interestingly, by allocating the quiet time, I’m enjoying the social/group time much more. Being aware of the differences means you’ll also be able to prepare much better for the various situations you’ll find at work and at home. Be flexible in how you approach your work and your workspace.Rework by Jason Fried and David Heinemeier Hansson really opened my eyes to the concept that we rarely do our best work at work. Quiet added to that and helped me to understand why the work you are trying to ship or even stages of that work, may dictate which environment suits you best.Choose silence at home alone, a café with people around but no interruptions, your desk with your headphones in, a meeting room with a handful or all of your team. The choice will vary for each of us at different times and for different work. For example, this blog post for me was best done in silence at home, a café suits me if I’m doing email and a meeting room is great for the discussion of a challenge after giving the team time to think through the issues. Consider others’ introvert/extrovert styles to get their best work.Giving introverts more time to prepare for group meetings was a really useful tip from Susan. If you’re chairing the meeting, ensure everyone is heard – don’t just take the loudest opinion, go digging for the best one. So take the time to consider where you lie on the spectrum between Introvert and Extrovert and consider how you can use this knowledge to get the best for yourself and your team. 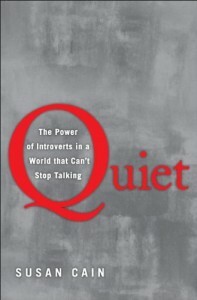 You might also like to read Susan’s blog: The Power of Introverts.